The sixth international “Every Child Deserves a Family” forum, which is organised on an annual basis by the Naked Heart Foundation for leading child development experts, NGO workers and families raising children with disabilities, will be taking place in Moscow from 2 to 5 October 2017. This year’s forum will focus on the incredibly important but rarely discussed topic of evidence-based support methods. What kind of support programmes exist for people with special needs, which are truly effective and which do harm? – These questions are often faced not only by families but also by the experts themselves. There are a huge number of support programmes in existence, but in order for them to be implemented and certified, their effectiveness must be proven through serious scientific research. Otherwise, it is very difficult to establish whether a programme will be worth the time and resources spent on it. Over the course of four days, leading experts from Russia and beyond will share their knowledge in that area. During the forum, participants will have a chance to familiarise themselves with modern and effective support programmes and discuss prospects for the development of a professional community in Russia. As usual, Naked Heart founder Natalia Vodianova will speak at the event. The main objective of the event is to provide a platform for communication and exchange of experience, not only between Russian and international specialists and NGO representatives but also with members of parents’ organisations. The forum takes place on an annual basis, giving participants the opportunity to regularly find out about the work of their Russian and foreign colleagues and facilitating the creation of a professional community in Russia. 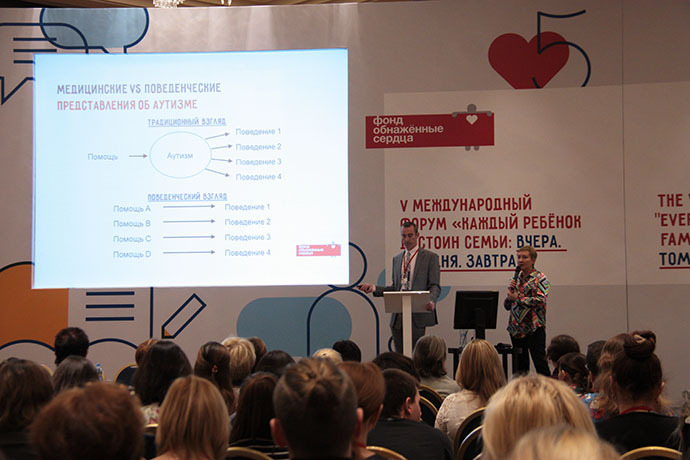 The topics covered this year in the presentations and master classes include: modern support programmes for children with autism who have behavioural disorders; the “Summer with Purpose” integrative camps for children and young people with autism; children with attention deficit disorder, anxiety disorders, dyslexia and Tourette’s syndrome – diagnosis and support programmes; evidence-based support programmes for children with foetal alcohol syndrome; and modern, family-centred rehabilitation programmes for children with motor disabilities. The full event programme and list of speakers can be found on the forum website: forum.nakedheart.org. Forum speakers will include: Dana Johnson, professor in the faculty of neonatology and paediatrics at the University of Minnesota; Kathleen Taylor, occupational therapist at the Center for Development and Disability, University of New Mexico; Dr Thomas Higbee, professor of special education and rehabilitation at Utah State University and director of the ASSERT support service; professor of psychiatry at the University of Minnesota Jeffrey Wozniak; Director of the Marcus Autism Centre and professor of paediatrics at Emory University Nathan Call; and other specialists from Russia and beyond. All the experts, including those from overseas, will be travelling to Moscow and speaking at the event on a completely pro-bono basis, at the invitation of the Naked Heart Foundation. In addition to top media executives and Natalia Vodianova, the following people have supported the forum and taken part in discussions in previous years: Vladimir Posner, Dima Bilan, Ksenia Sobchak, Lika Kremer, Svetlana Zeynalova, Svetlana Sorokina, Anita Gigovskaya, Sergey Belogolovtsev, Elena Korovina, Andrei Loshak, Sophiko Shevardnadze, Avdotya Smirnova, Lyubov Arkus, Anton Komolov, Rustem Adagamov, Bakur Bakuradze, Ekaterina Gordeeva, and the Russian Deputy Minister of Education and Science Benyamin Kaganov, among others. We expect the event to be attended by participants from more than 80 towns and cities and nine different countries – Russia, Belarus, Ukraine, South Africa, Chechnya, USA, Finland, Estonia and Kazakhstan. Participation in the forum, accommodation in Moscow and subsistence are absolutely free of charge, the participants’ organisations paying only for their travel to Moscow. The forum will be held at the Renaissance Moscow Monarch Centre Hotel.